In this paper we pursue the work started jointly with Richard M. Goodwin in the 1990s. Goodwin's later work went very much in the direction of modelling Schumpeter's insights into structural and technological transformations in the context of disaggregated models while allowing for non-full employment outcomes and macroeconomic cyclical patterns to develop anlongside these transformations. In a series of papers we have followed up this work for closed and open economies, drawing out in particular the implications of structural transformations for macrodistributional dynamics and effective demand problems. This has been analysed for advanced and catching-up economies and their interdependencies on the global stage. 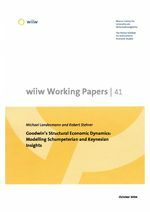 We shall review our modelling efforts in this respect and trace these back to Goodwin's life-long preoccupation with synthesizing disaggregated (linear) modelling with macro-dynamic analysis.